An exclusive release by Chanel means many people are looking for duplicates to avoid having to track down limited items. This last release of Les Khakis is no exception. 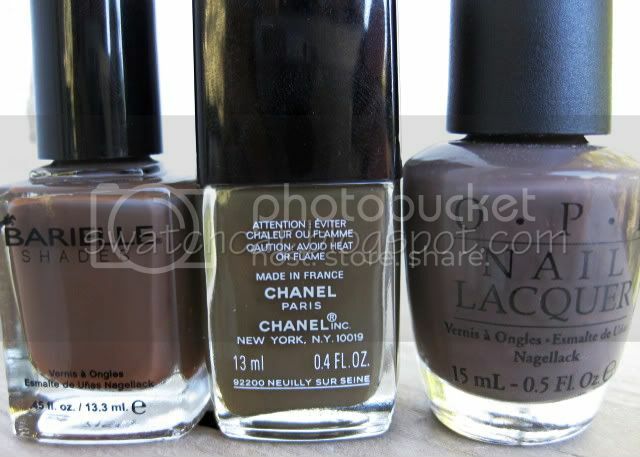 Pretty, muted polishes just begging to be purchased. But, can you get the same look for cheaper? Ahh, yes, the $100,000 question. Let's see, shall we? 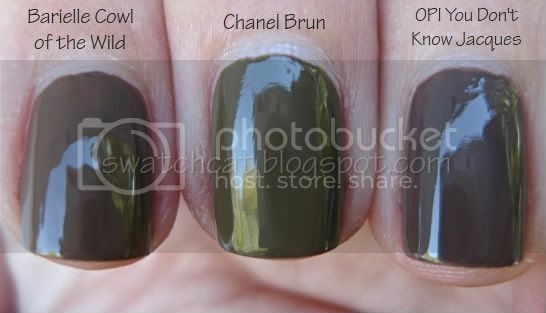 Up first, Khaki Brun. I dug out my two other deep taupey brown polishes, Barielle Cowl of the Wild and OPI You Don't Know Jacques, to see if they were a match. Nope, not even close. You can really see the green undertones of Khaki Brun, and the purple undertones of You Don't Know Jacques also stand out. Cowl of the Wild stands out as a true neutral taupe, no warm or cool undertones whatsoever. Next, Khaki Rose. I pulled out Barielle Cashmere or Loose Me and Zoya Dea since they are both warm, medium browns. I thought Cashmere or Loose Me might be close, especially since the shimmer is pretty subtle. However it much more rosy than Khaki Rose. 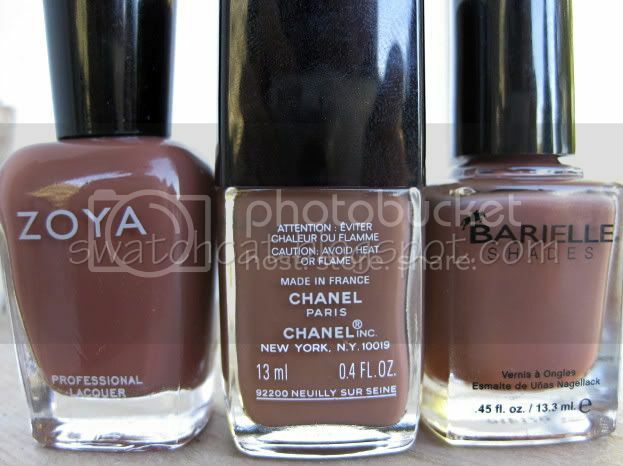 Same for Dea, which I had pegged as being a latte color. Sandwiched between Cashmere or Loose Me and Dea, Khaki Rose comes off a quite brown and well, khaki. Those rosy undertones just disappear. That leaves Khaki Vert for last...and I've got nothin' for ya. Sorry!